CHRISTINA HAN is a soprano specializing in Renaissance, Baroque, and modern music. She was born and raised in Queens, New York; she attended LaGuardia High School of Music & Art and Performing Arts and at the Mannes School of Music preparatory division. 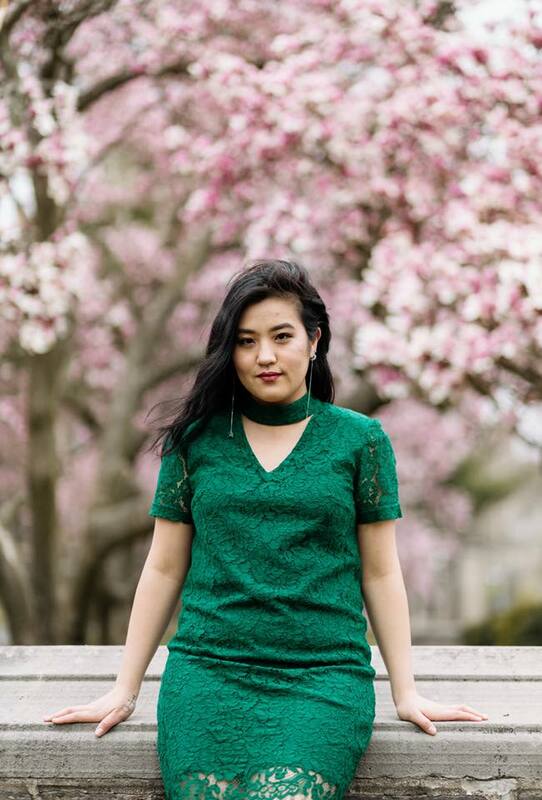 Currently, she is a candidate for a Bachelor of Music degree in Vocal Performance at Westminster Choir College and studies with Margaret Cusack. She is a devoted chorister, serving as a member of the Westminster Symphonic Choir, Kantorei, and the namesake Westminster Choir. In addition, she is a passionate sacred musician, working as the Music Minister/Organist at Christ Congregation in Princeton, NJ as well as a soprano of the Lux Choir of the Episcopal Church of Princeton. This past year, Christina was a soloist at the Lindsey Christiansen Art Song Festival performing Tonia Ko’s “Smoke and Distance,” was a chorister for Handel’s Messiah with both the New York Philharmonic and the Philadelphia Orchestra, and performed the role of First Spirit in Die Zauberflöte at Westminster. Future performances include the Mozart Requiem (NYP), Beethoven’s Symphony No. 9 (NYP), Joby Talbot’s Path of Miracles (Spoleto Festival), alongside other solo performances. GRACE VOLKER, mezzo-soprano, is a Hays, Kansas native and graduates from Kansas State University in May with a Bachelor of Music degree in Vocal Performance, studying under Dr. Patricia Thompson. Throughout her collegiate career, her roles included Third Lady (The Magic Flute), The Cat Lady (Speed Dating Tonight) and most recently Ruth (The Pirates of Penzance). She has annually advanced into the semi-final rounds of the Western Region NATS competitions, placing in the 2018 finals and advancing to the National NATS competition. Last summer, she studied in the Opera Studio of the American Institute of Musical Studies in Graz, Austria. Selected as the Mezzo-Soprano Young Artist at the Ad Astra Music Festival, she looks forward to a wonderful summer in Kansas. This fall, Grace will begin studies for her Master of Music degree at the Jacobs School of Music at Indiana University. BO SHIMMIN is a tenor hailing from Tucson, Arizona. In May, he will graduate with a Bachelor of Music degree in Vocal Performance from DePauw University in Greencastle, Indiana. He has been seen in productions by DePauw Opera and Theatre as Le doyen de la faculte (Cendrillon) and Pablo (Sister Act) and Daniel Buchanan (Street Scene). Last summer, he portrayed Tobias in Hawaii Performing Arts Festival’s production of Sweeney Todd. He spent the spring of 2018 in Milan, Italy studying with soprano Patrizia Zanardi. In the summer of 2017, he performed with Opera in the Ozarks company in over 25 shows including Trouble Man (Jack and the Beanstalk), chorus (Carmen), chorus (Le Nozze di Figaro), and Tamino in their scenes program. In 2016, he earned an internship as a festival staffer for Central City Opera in Colorado. Bo is currently studying with Andre Campelo and Laura Brumbaugh. JACOB LAY, bass-baritone, is from Ellenwood, Georgia and studies Vocal Performance at Simpson College in Indianola, Iowa under Professor Bruce Brown. Entering his senior year, he has performed in five operas at Simpson, including Little Women by Mark Adamo, performing the role of John Brooke, and Acis and Galatea by Handel, performing the role of Polyphemus. This fall he placed second in the Iowa District NATS Student Auditions, as well as singing the baritone solo in the Oratorio de Noël by Camille Saint-Saëns. He is a member of the chamber choir and madrigal singers at Simpson College, the latter previously being directed by Dr. Robert Larsen. Jacob plays the violin and piano and enjoys them as much as he enjoys singing. He has enjoyed success with composition, winning the GMEA Student Composition Contest three times, placing 3rd in the Atlanta Symphony Orchestra Student Composition Competition, and winning the NAfME Student Composers Contest with his works for instrumental ensembles.